If you're looking for a free plagiarism checker then you should definitely check Quetext out. It is an efficient and legit content plagiarism checker. Wondering what Quetext is all about? 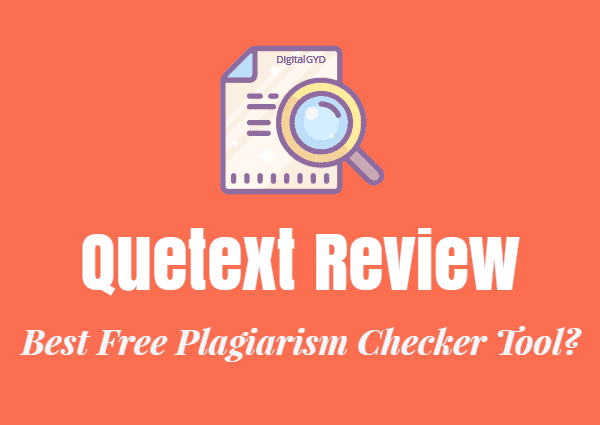 In this Quetext review article, we’ll discuss everything you need to know about this free plagiarism checker including the good, the bad and the ugly. Quetext is a leading plagiarism detection software and citation assistant that combines DeepSearch™ technology with clear feedback to detect duplicate content and prevent plagiarism. With over 1 million users worldwide, Quetext has been helping teachers, students, bloggers and professional writers to improve their writing. Recommended Reading: 7 tips to successfully avoid plagiarism once and for all. We’ve listed Quetext in our ever-updated list of Top 20 best plagiarism checker tools because it offers an unique approach to detect copied content based on its proprietary DeepSearch™ technology. DeepSearch™ allows it to check your writing for traces of contextual plagiarism and not simple word or phrase matches. …where we’ll access all of its features, what it offers, its pricing model and if Quetext is safe or legit to use. 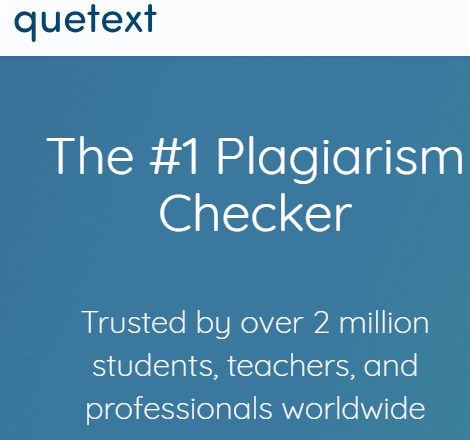 Quetext is one of the best free plagiarism checkers you can find online. With it’s advanced technology like DeepSearch™ and it’s focus on keeping the notes and writing uploaded by users safe, Quetext is definitely a must have tool in your content arsenal no matter you’re a blogger, freelance writer or a academic professional. It has some of the largest searchable databases of books, web pages and over 1 million journals, this citation assistant makes it pretty difficult to bypass with your duplicate content. Needless to say, this adds to the nightmare of anyone wondering how to plagiarize without getting caught. One key thing that caught my eye during this Quetext review is, the site more or less replicates Grammarly’s site design which I think is not necessary. On a side note, you might want to check out our Grammarly review that offers far better features. It’s good to be influenced by a leader in your industry but I think their web design team could have done something fresh here. Another thing I saw was inconsistency of data across their site. For example, their homepage describes it being used by over 2 million writers, bloggers worldwide whereas if you dive deep into their about page they state they have 1 million users worldwide. The gap is huge and might be the result of carelessness of someone who maintains their website but as a company you gotta look into these details as they can cause trust issues and loss of credibility. This is when you might want to check out more professional & better alternatives to Quetext. Let’s now head over to what features Quetext has that makes it an efficient plagiarism detection software. DeepSearch™ is Quetext’s proprietary algorithm that sets it apart from other plagiarism checkers. With DeepSearch™ it uses contextual plagiarism rather than the normal phrase match procedure to detect percentage of copied content used by other plagiarism checker tools. DeepSearch matches a given phrase on the context of nearby words and phrases (or even sentences) in the paragraph to see if they’re copied or not. Since the probability of two sets of phrases (or sentences) matching in two separate instances is almost zero, the chances to get away with plagiarized content with Quetext is almost nil. This strict scanning for plagiarism makes it one of the best plagiarism checkers for teachers and people like me who outsource a lot of content via freelance writers. While this is definitely one of the pros of Quetext, better alternatives to Quetext. Quetext has a vast, searchable database consisting of 20 million books, 35 billion web pages and over 1 million academic journals to make scanning for any traces of duplicate or plagiarized content as effective as it can get. Most free plagiarism checkers do not even have a fraction of the volume of database it offers. Quetext claims to respect the intellectual properties of users who use their service. No documents uploaded to their database will be stored n their database after you’ve used them. It also does not claim any rights to your documents or properties for using their service. Quetext offers multiple file uploading to bulk scan plagiarism easily. You can upload up to 5 documents at once and the supported file formats are PDF, MS Word and plain text files. If you’re looking for a plagiarism checker that lets you export a PDF report of the document scanned, Quetext is your thing. In fact, with the pro version, you get to keep all your reports of every file you’ve scanned for plagiarism and download them as and when needed. Sometimes, you might not want to get your writing scanned and checked for similarity with certain sources. Quetext let’s you do just that by excluding sources you don’t want to show up in results. Your content will not be matched with these excluded sources for traces of duplicate content. 7. How Accurate Is Quetext? If you’re wondering how reliable is Quetext, based on what I found out the tool detects out plagiarism pretty good. With the large volume of searchable database and their DeepSearch™ technology you can rest assured about the accuracy. How Does Quetext Plagiarism Checker Work? 1. What Services Quetext Offers? Citation assistant to improve writing. 2. How To Use Quetext? If you just want to try it for free, just copy your text and paste it in the box given. Click on “check plagiarism” button to start the process. The results will arrive in a moment with some text marked in RED color. These parts marked in RED are plagiarized content. Hover on them to find the source of original content and tips to remove them. If you want paid version, you can create an account by clicking the “signup” button on the top-right. Quetext is free to use as a plagiarism checker for up to 5000 words. The pro plan of Quetext starts at $9.99 per month and comes with access to Quetext’s pro features like multiple file upload, generating PDF reports or increasing the word count limit per search. The pro version allows you to increase your word limit per search to 25,000 words (from 5000 words in the free plagiarism checker) and the chance to exclude certain sources so that your content is not matched for similarity with them. 4. Is Quetext Safe? Is Quetext Legit? Wondering if Quetext is legitimate? With what I found on their website, Quetext values user privacy so much. They claim to never illegally claim your data or documents that you submit for scanning as theirs. Quetext also never stores any information or submitted content on their database (many other plagiarism checker tools do it) which is a sign of a good plagiarism checker at hand. What Are The Pros & Cons Of Quetext? Like every unbiased review on this site, this review of Quetext also comes with its own set of pros and cons that you need to weigh before using it. Respects user privacy and doesn’t store your submitted content in their database. Requires paid subscription to scan more than 3 documents or documents more than 500 words. Lack of site consistency which I mentioned above builds trust issues. After a quick search on Reddit and then a detailed scan, I couldn’t find any anything meaningful about Quetext. So, I thought of giving a try myself and presented the above review. I hope it helps you and solves your questions on the tool. 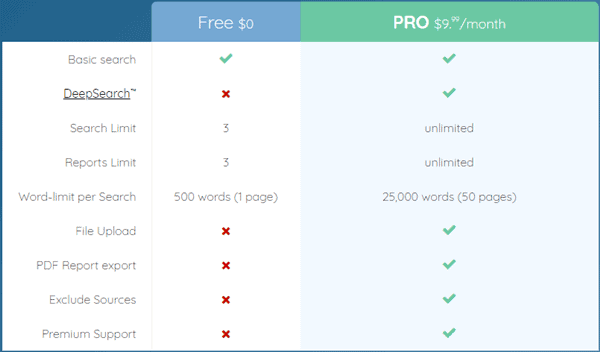 Grammarly is the top alternative of Quetext in terms of functionality and pricing. It also serves as your grammar checker tool that corrects over 400+ types of grammatical and contextual errors in your writing. Grammarly’s plagiarism checker tool offers more detailed analysis of plagiarism along with percentage of copied content in the document. Apart from that, it has a plethora of other useful features like proofreader service etc to improve your writing. You can read more about it in my detailed Grammarly review where I jot down my experience with this tool and how it has helped my writing to improve. Whitesmoke is another fitting Quetext competitor with more features and a more flexible pricing plan. It offers one-click instant proofreader service along with translation feature with the same pricing you’d pay for Quetext which I think is a steal deal. ProWritingAid is another well advanced alternative to Whitesmoke, (even Grammarly & Quetext for that matter) that offers a very efficient grammar and editing tool that’s a favorite of authors, copywriters, scriptwriters, students and professionals. It offers style editing features, checks for repetitive errors, and acts as a comma corrector and passive voice checker among all. Let’s not forget it also is one of the best plagiarism checker. Check out our ultimate ProWritingAid review for 2019 for 2019 to see what more ProWritingAid offers. You can also avail an massive ProWritingAid coupon of 25%. If you’re looking for a free alternative for Quetext, Duplichecker should do your job seamlessly. It has 1000 word limit to each search as compared to 500 word limit on the free version of Quetext plagiarism checker. SmallSEOTools also provides a very basic yet reliable plagiarism checker that is mostly used by bloggers, writers and freelancers. If you’re looking for a free plagiarism checker without word limit then SmallSEOTools is what I recommend. I hope you liked our detailed review of Quetext and it gave you a complete idea about what the tool is, what it offers and its accuracy. If you’re looking for a free duplicate content checker, Quetext does it job fantastically but if you’re opting for the paid version there are better alternatives like Grammarly or Whitesmoke that offer more value for money and more features with less the price.